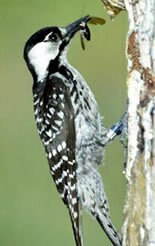 The red-cockaded woodpecker is found in the southeastern United States from Florida to Virginia and west to southeast Oklahoma and eastern Texas. It is about the size of the common cardinal, about 8.7 inches long and with a wingspan of about 13.8 inches. Its feathers are black and white with white bars on the back. Its underside is white to gray with notable black spots along the sides of the breast. Males have red spots on each side of the nape, but they are rarely exposed. Females are larger than males and lack the red spots. The most distinguishing feature of this species is its black cap which is called a "cockade." These birds require mature pine forests for their habitat, and the pines must be at least 80 years old. Woodpeckers species normally prefer dead trees, but this species only prefers living pine trees. Diet consists mainly of insects such as beetles, ants, roaches, and caterpillars. They also eat eggs, larvae and spiders. They are able to find their food in the pine trees by ripping loose the bark from the surface with their bills. This species is very social and prefers to live in small family groups of 6 to 10 birds called "clans." Breeding occurs with the same mate for several years, and they nest from April to June. The female lays three to four eggs, and all members of the clan help to incubate the eggs. 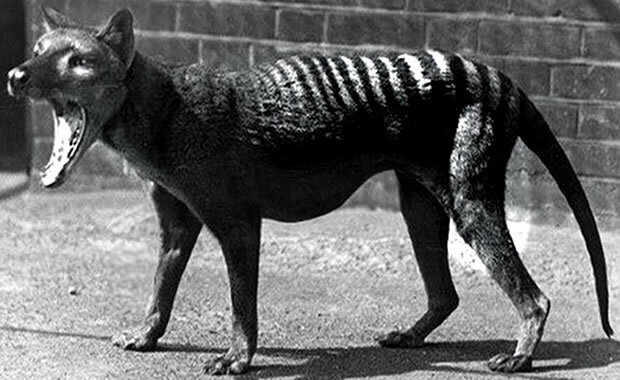 The primary threat to the species is habitat loss due to logging and agriculture. Also, in 1989, many trees and woodpecker nests were destroyed by Hurricane Hugo. A recovery plan has been developed which consists of reintroduction of captive females into the wild and the restoration and management of its natural habitat. Copyright Notice: This article is licensed under the GNU Free Documentation License. It uses material from the Wikipedia article "Red-cockaded woodpecker". Glenn, C. R. 2006. "Earth's Endangered Creatures - Red-cockaded Woodpecker Facts" (Online). Accessed 4/25/2019 at http://earthsendangered.com/profile.asp?sp=940&ID=9. Need more Red-cockaded Woodpecker facts?